THE NATIONAL Green Tribunal has said that the Ministry of Environment, Forests and Climate Change should appoint only those people as chairpersons and members of expert appraisal committees who have “expertise and experience” in environment-related issues. In a judgement delivered on July 17, the court also said that the expertise of chairpersons should be in the area with which the committee is concerned. Expert appraisal committees (EAC) exist at the Union as well as state levels (state expert appraisal committee or SEAC) to advise the government on environmental clearance of development projects. The directions issued by the Justice Swantanter Kumar-headed principal Bench of the National Green Tribunal (NGT) are applicable to committees at both the levels. The role of EAC is integral to the process of granting environmental clearance to development projects. According to the Environment Impact Assessment (EIA) Notification, 2006, evaluation of proposals involves four steps: screening, scoping, public hearing and appraisal. EAC/SEAC are involved in various capacities in all the stages, except for public hearing. The selection criteria for EAC chairpersons are also given in the notification. “The [NGT] directions follow a close reading of the EIA Notification, 2006, where the criteria for choosing the EAC chairperson specify that he/she should be someone with expertise in public administration/management,” says Neeraj Vagolikar of non-profit Kalpavriksh, a petitioner in the case. The court observed that the selection criteria are not appropriately outlined and has asked the Union Ministry of Environment, Forests and Climate Change (MoEFCC) to revise it. Till the revision is done, no new appointment can be made, says the order. The NGT order came in response to a petition originally filed before the Delhi High Court in 2011. Apart from Kalpavriksh, Goa Foundation and Manoj Mishra, retired chief conservator of forests of Chhattisgarh, are also party to the petition. The case was transferred from the High Court to NGT in April 2013. The petition held that the primary objective of MoEFCC is to protect the environment and EACs, being the key bodies advising the ministry on environmental clearances, have a vital role. But these committees have given several controversial decisions because the chairpersons lacked requisite expertise, states the petition. The reason behind this is the change in the selection criteria of EAC chairpersons. Since the first draft EIA notification of 1992 where the emphasis was on expertise, the focus has shifted to managerial ability (see ‘Changing criteria’). However, MoEFCC says the criteria, as specified in the EIA Notification of 2006, have been modified through a ministry notification issued in October 2007. But it is worth noting that the modified provision still retains the clause “public administration or management” expert for selectingEAC members. The MoEFCC currently has seven EACs for different sectors. 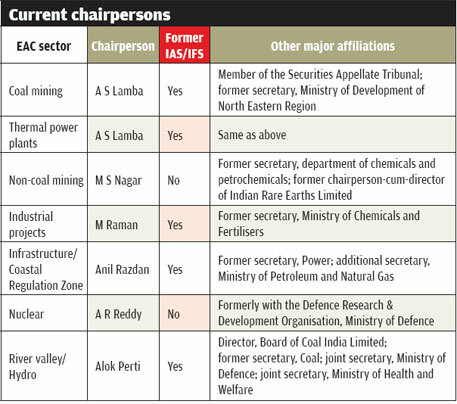 Of the six EAC chair- persons (coal and thermal power have the same head), four are from the Indian Administrative Service. It is difficult to ascertain how the experience they have helps them comprehensively evaluate the environmental and social impacts of a proposed project. “A S Lamba, who holds the crucial chair position of two major sectors—coal mining and thermal power—has barely been affiliated with an environment- and forest-related position,” says environmental lawyer RitwikDutta. Lamba’s last posting was as secretary, Ministry of Development of North Eastern Region. Prior to that, he was a special secretary in the Ministry of Agriculture. He has also held various administrative positions in the Ministry of Surface Transportation (see ‘Current chairpersons’). Similar is the case of AlokPerti, chairperson of EAConriver valley and hydro sector. “Perti was involved with the coal ministry between 2009 to 2013, holding various administrative positions, and in ministries like defence and family welfare before that,” says HimanshuThakkar of South Asia Network on Dams, Rivers and People. 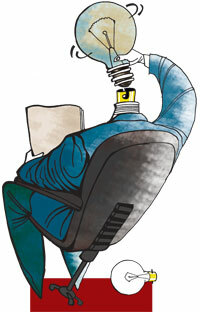 His current affiliation with the board of Coal India Limited also raises questions of conflict of interest. The situation is a little better as far as appointment of members to EACs is concerned. An analysis of the background of EAC on coal and thermal power shows that the committee includes people who have been involved in these areas. One of the members, A K Bansal, has been the additional director general of forests in the Union ministry. Another, N K Verma, has been the additional director of the Central Pollution Control Board Similarly, C R Babu has served on the faculty of the School of Environmental Studies at the Delhi University. Though the petitioners agree that the situation is better as far as appointment of EAC members is concerned, they say it “still remains problematic given the central role of the chairperson, particularly with them being ex-bureaucrats in commanding power”. Considering the huge development push underpinning the current Union government’s agenda, a revision in the criteria for appointing EAC chairpersons is certainly needed. Appointment of EAC chairpersons based on their managerial merits is also problematic because such an approach focuses on meeting development goals and environmental fallout remains a secondary consideration. NGT’s observation is significant in this regard: “If people who are not strictly qualified and eligible in the field of environment are selected as members of EAC/SEAC, the obvious result would be improper application of mind. ” The order adds that this “would lead to improper consideration and disposal of application for clearance filed by the project proponent”. As I said earlier in my comments, it is ridiculous on part of MoEF to appoint retired IAS officers, who dont have experience in the environmental matters, to head the Environmental appraisal committees and the so called experts on those committees are the political appointees except for a few experts who know something about the environmental issues of the projects under consideration. Same is the case with the appointment of State SEACs. I had cited an example of Maharashtra. If we carry out an audit of the SEAC Chairpersons and Members about their qualifications and experience in the field of environment, glaring deficiencies will be noticed. NGT is absolutely right in its verdict on appointment of those committees and it has to be followed by MoEF in a letter and spirit if we want to see right persons occupying the committee seats.Since the experts do not have adequate knowledge of the subject, their questions on in the SEAC and EAC meetings on the projects are absurd and the solutions suggested by them are also unreasonable. I can give several examples on this issue.The most depressing fact is that the retired officers threaten the project proponents and consultants during the deliberations on the project thinking that they are still the working bureaucrats. I can cite examples on this issue too.this culminates in delays to get approvals and thus defeats the time period laid down in the notification for grant of ECs.This has to stop immediately if India wants to progress and the retired IAS and IFS officers should not rock the cradle known as EAC or SEAC.